Manila: The death toll from the first storm to batter the Philippines this year has climbed to 40, officials said on Sunday as authorities in Eastern and Northern Mindanao continue to make preparations for its onslaught. Due to its slow five kilometres per hour movement, tropical depression “Lingling” is expected to affect the southern main island of Mindanao until Wednesday, the Philippine Atmospheric Geophysical and Astronomical Services Administration (PAGASA), said. Lingling, referred to in the Philippines as tropical depression “Agaton,” is bringing 55 kilometres per hour winds and storm signal No 1 continues to be observed in the provinces of Surigao del Sur, Agusan del Sur, Davao Oriental, Davao del Norte, Davao del Sur and Compostella Valley. “Orange Rainfall Alert is being observed in certain areas and estimated rainfall amount is from 5 to 15 millimetre per hour (moderate to heavy) within the 300 kilometres diameter of the Tropical Depression. It is expected to bring moderate to occasionally heavy rains and thunderstorms over Bohol, Siquijor, Northern Mindanao and the rest of Caraga Region,” PAGASA said. Lingling had evolved from a low-pressure weather system several days ago and now a tropical depression that us threatening to bring more rains and misery to the provinces of Surigao Del Sur and Compostela Valley. As a precaution, the military’s Eastern Mindanao Command on Sunday said its units have assisted local government branches in the area in the pre-emptive evacuation of residents. According to Eastern Mindanao Command spokesperson Captain Alberto Caber, soldiers are helping the Surigao Del Sur provincial government enforce pre-emptive evacuations in the coastal communities of Cantilan and Cortez towns and Tandag City. In its 4pm Sunday bulletin, the National Disaster Risk Reduction and Management Council (NDRRMC) said the number of people killed from the effects of Lingling had reached 40 in Mindanao while the affected population had reached 590,000. 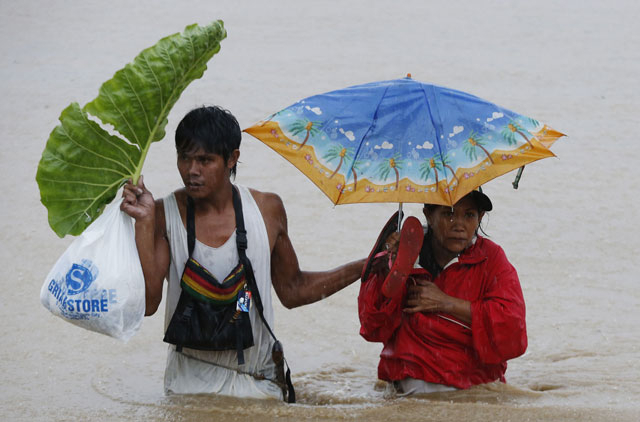 Meanwhile, more than 10,000 Indonesians have fled their homes in the capital due to flooding that has left five dead, an official said on Sunday, with people using rubber dinghies and wading through waist-deep water to reach safer ground, AFP reports. 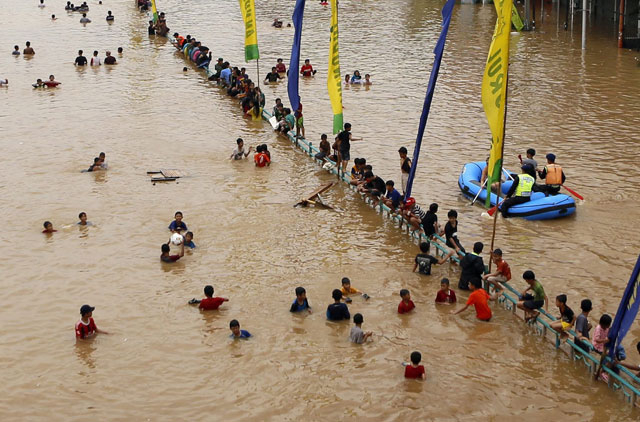 Many parts of Jakarta were under murky, brown water, while on the vast archipelago’s northern Sulawesi island the death toll from flash floods and landslides rose to 19. Buildings in some parts of sprawling capital, which has a population of 10 million and is regularly afflicted by floods during the six-month rainy season, were half submerged, with roads unpassable in many areas. “So far 10,530 people in Jakarta have been displaced by floods caused by heavy rains,” disaster agency official Tri Budiarto said. Budiarto confirmed the toll and said those killed had either died by drowning or being electrocuted. However, the floods were yet to reach the same level as last year when the central business district was left under water. On Sulawesi, around 40,000 people were still displaced following flash floods and landslides earlier in the week, local disaster agency chief Christian Laotongan said. “The floods have subsided but houses were wrecked, and furniture and belongings were damaged, so people have not been able to return,” he added.